When I go into drawing preferences to set parameters, I see a list of four "viewports". Can someone tell me what these are for please? Or what do they relate to? Last edited by Jim0000 on Sun Oct 15, 2017 7:17 am, edited 1 time in total. 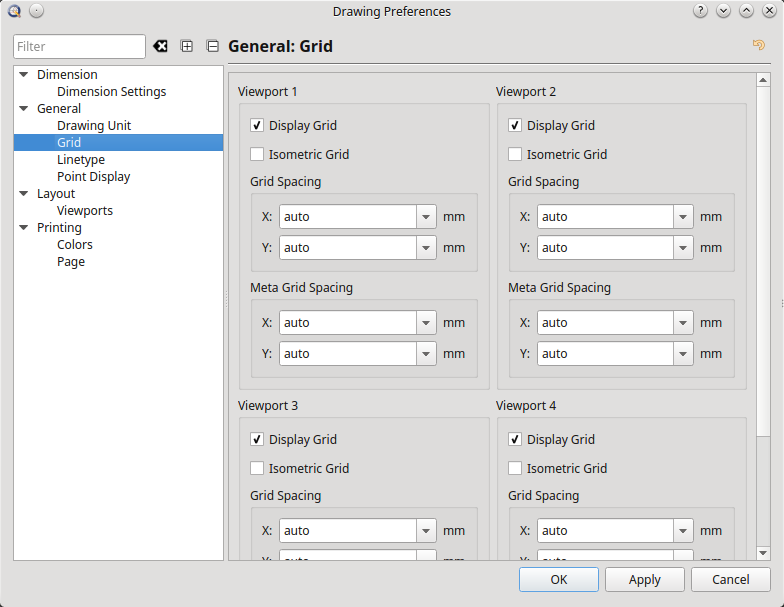 Re: Drawing Preferences - four viewports? This function brings you in the position to view your drawing with multiple views at the same time what means your drawing can be divided in up to four views and every single View can have a different zoom factor or even Grid setting. Imagine your drawing is pretty big. With a two View setting it would be possible to see everything (1. View) what is in your drawing and in the other View (2.View) you are able to work with a high zoom on a detail in that drawing. Regardless how many Views you will use - it is nevertheless still only one drawing! Very good, thanks for the explanation Husky. It leads to the next question; how are multiple viewports selected? Jim0000 wrote: It leads to the next question; how are multiple viewports selected? lphilpot wrote: Is there a hot key or other means to quickly add/remove viewport(s) other than going into Preferences? No. There is a short cut (ctrl+I) to open Drawing Preferences but then you have to navigate to View Ports manually. Husky wrote: No. There is a short cut (ctrl+I) to open Drawing Preferences but then you have to navigate to View Ports manually.